Performing Arts Schools have a history and reputation of developing some of the nation’s strongest artists, but what about those who do not demonstrate as much natural ability for the arts. Is a Fine and Performing Arts School right for them? Studies have shown that students who regularly participate in the arts are more likely to demonstrate increased academic achievement. One study conducted by Turnaround Arts reported a significant improvement in academic achievement, reduction in disciplinary referrals and an increase in attendance in schools that had regular classes in dance, music, art, and drama. In addition, the study found that these schools outperformed comparable schools in their city or state that received federal funds for school improvement. Students are challenged continually through the arts to think critically about what they are doing. Some questions that may arise are: How do I express a certain feeling when dancing? How do I turn any form of artistic media (watercolors, clay, Lego's) into an artistic creation? What choices should I make to portray a character? Practicing problem solving will develop children’s abilities for reasoning and understanding. This will help develop important problem-solving skills necessary for higher levels of learning and for future careers. Attention plays a crucial role in learning and memory. Teachers are constantly demanding the attention of students because of this fact. The arts help students develop this necessary skill. 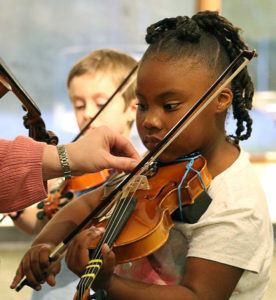 Whether its teaching discipline by repetition or the ability to simultaneously concentrate on personal and group contributions to what is being created, the arts give students the opportunity to repeatedly practice their focusing skills. This one goes without being said. There are numerous stories, including that of the Executive Director, in which the arts were a catalyst for the achievement of personal goals. The arts require that students step out of their comfort zone and to make mistakes as part of the development process. Through this process, students are able to tangibly see the positive results of their hard work and will be able to confidently perform in front of large groups. This benefit can boost their confidence in many areas of life.